Oh look… it’s January, 2017… As in, AFTER the holiday season. I feel as though I have barely blinked, and now it is time to take down all of the holiday cards I looked so forward to finding in my mailbox each day. Oh the glorious mess.. 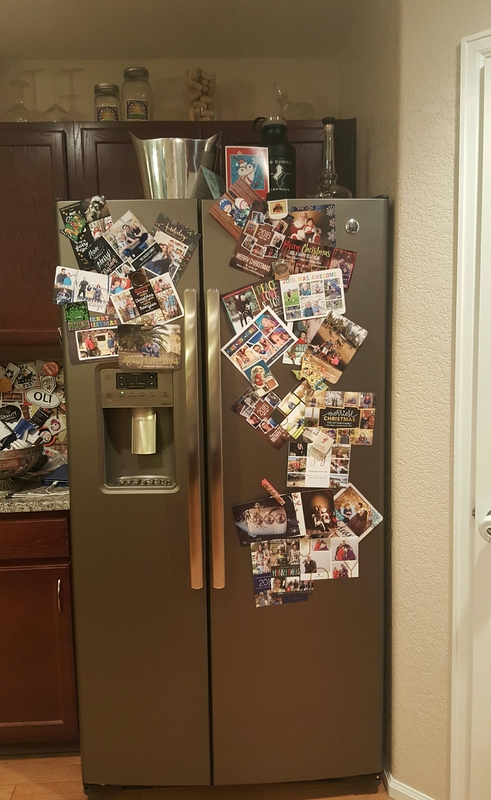 I even put them on The New fridge! This year, more than other years even, I seem to have a significant case of the post-holiday blues. I can’t let it go. 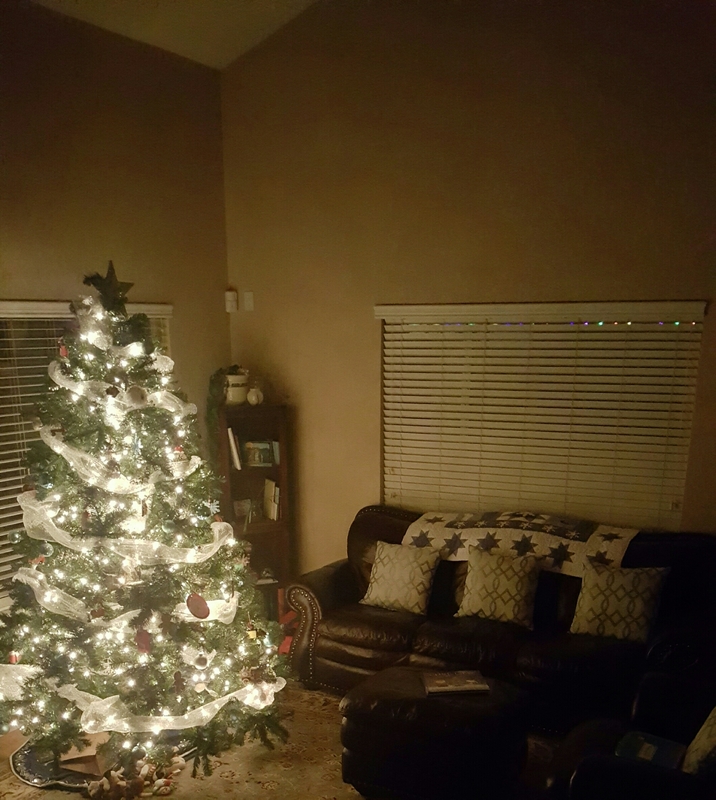 Tonight, after everyone is in bed, I am 100% sure I will sneak over and turn on the Christmas tree lights. I will sit in my cozy Vicki’s Secret reindeer jammies with my hot toddy (hello, first cold of 2017,) in the glow, wondering where the season went. 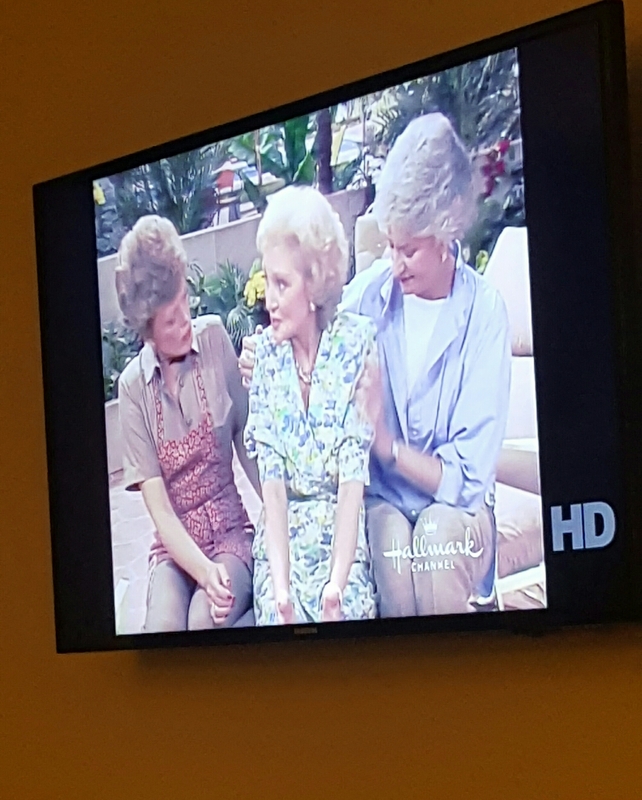 I can’t watch TV- flipping to the Hallmark channel to find Blanche, Rose, Dorothy and Sophia having reclaimed their nighttime reign from the grips of the 24/7 holiday romance offerings made me shoot the candy cane in my mouth clear across the family room. They traveled down the road, and back (to Hallmark) again. I can’t hide it, I am having a tough time closing the door on it all this year. 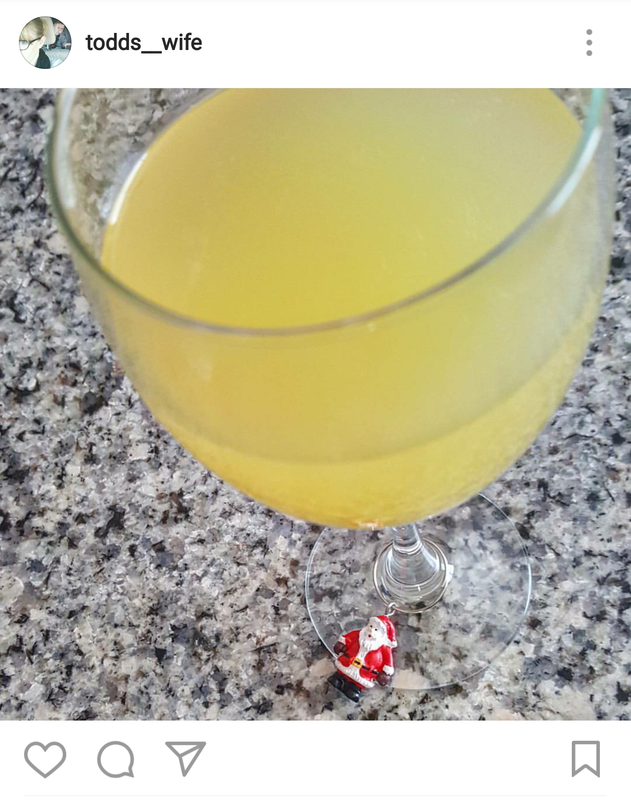 Santa charm still firmly affixed to mimosa, as seen Jan 2nd. Even Jr is over me it at this point. 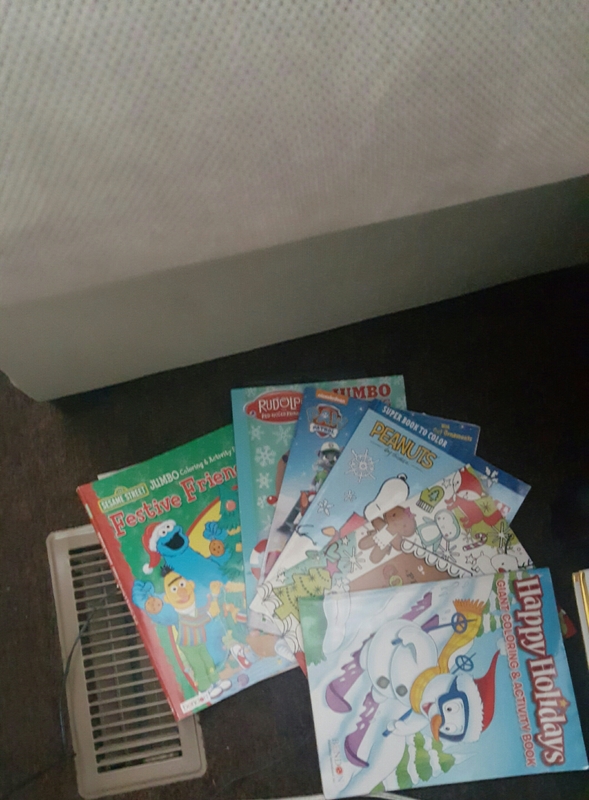 Yesterday, on his last day of holiday vacation from school, I took a break from reports on my laptop for some coloring time (we lovey the coloring… I will color with that kid until College if he lets me,) and I busted out the pile of holiday coloring books when he said I could pick the picture. Maybe it is him getting older, or my parents getting older, or ME getting older (yes, we all do that, Keri;) or Jr being on break for so long and us getting into a new routine, or the sense of uncertainty 2017 is bringing, or missing the family in Texas we didn’t go see this year… or it is just subconscious laziness about putting away the holiday décor. Maybe, as I used to dread and now pray, I truly am turning into my mom. The snow falling outside would have seemed festive just days ago…. Now it is just going to make getting Jr to school tomorrow a PITA. Can I just cling? Just through one more weekend… Just until this latest cold/snow snap moves out of the Colorado front range? Then I promise to bring up the boxes and un-deck the halls. Shhh… they are hidden behind the table by the couch, we have a brand new box of super sharp crayons from Santa if you need to jingle some bells or something to get you through. 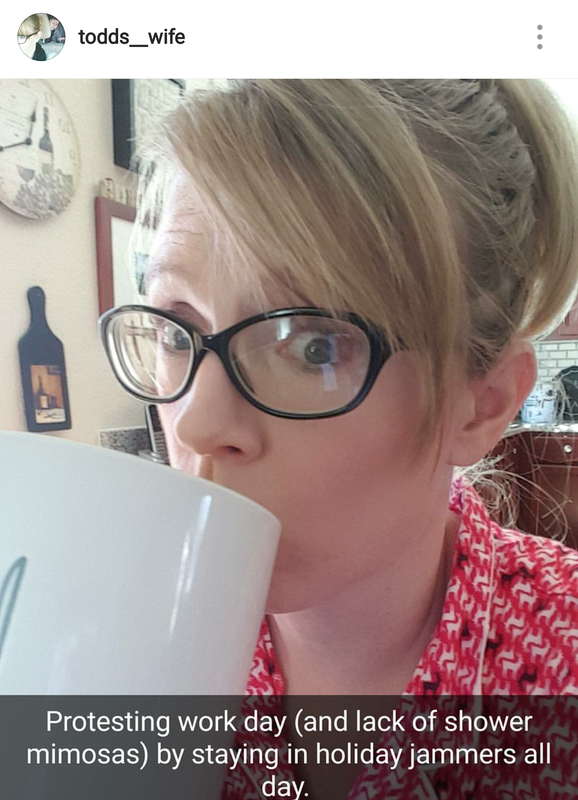 No judgment from the girl clinging to her pikes peak blend with 3 pumps of SF peppermint, yo. This year we were all about traditional… except a little askew – because us. Have I mentioned I’m a holiday card junkie? Not only do I consider it my personal duty to pepper the globe with Season’s Greetings from our little family, but every December I practically skip to the freaking mailbox every day to see what treasures are buried in between grocery circulars and gift catalogs. I can’t get enough warm winter wishes – I am always jonesing for the next jingle-gram to come fa-la-la-ing down the lane in the postal carrier’s bin. This year I am rigging up a ribbon/clothespin display situation on the coat closet door since our new and shiny fridge is an off-limits zone for magnetized decorating. It is going to be EPIC –twice the space to fill. No card crowded behind another. If you are thinking of shrinking folks off of your card list this year I say NAY NAY – this season send more love than ever – don’t subtract, ADD. And if you find yourself with an extra, there is always a girl in Colorado looking for her next fix. Jr BEGGED The Mr to blow up the Minion “just one more time” after Halloween. This happened. 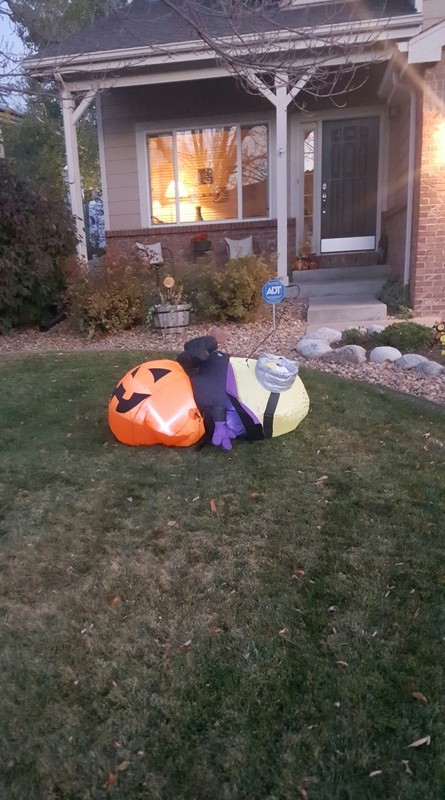 Look dude, when vampire Minion passes out off his pumpkin on the front lawn, Halloween is over, m’kay? It’s snowing. Along the Colorado front range tonight, it is FINALLY snowing. This year, in this house, Halloween just won’t freaking die. This party involves playing the Peanuts theme song and dancing. Over and over. 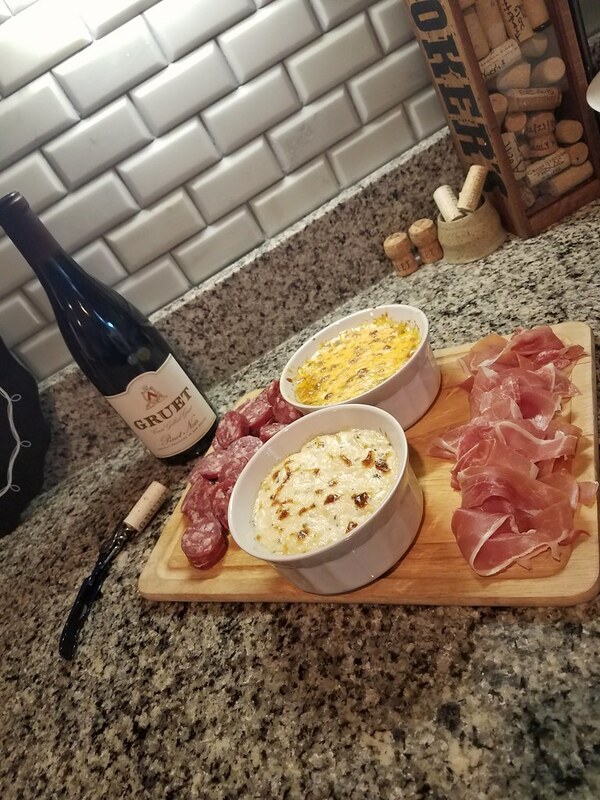 Don’t get me wrong – I totally believe in the Great Pumpkin, and I am strangely proud of how long a 5 year old can ration a candy supply (1 piece in his lunch, 2 pieces after school,) but let’s move Spookley off the top of the toy bin and start shining the play stove to cook up some Turkey, eh? OR – if we MUST – then at least relent to letting mom pack up the colorful leaves and decorative gourds in favor of mistletoe and tinsel and stockings hung by the chimney with care, shall we? We have had years of being fairly frightened of Halloween. Last year I had to carry him out of the garage kicking and screaming to get the trick-or-treat train movin’ around our ‘hood. This year suddenly he is determined to see it last for.ev.errrrrrrrr. The ridiculously warm weather has been no small contributing factor, I think. I mean, it still LOOKS like Halloween outside – all leaves crunching under his little feet and clear blue sky against not-quite-yet-bare trees. I get it, I really do. But I am not here for it anymore, people. The minute we got him home from school, I dressed him up like Ralph’s little brother in A Christmas Story and shot him out the back door to frolic in the 1/2 inch or so that had accumulated thus far. Because we are moving on, yo. So snow on, snow storm…. blow the Halloween Hangover from these halls, pronto. It’s Beginning to Look a Lot Like Chis… WTF!? In keeping with my fairly predictable tendency toward unpopular opinions, I am of the mind that a Christmas Tree or some festive winter garland on the mantle makes Turkey day that much more festive. What the heck, deck those halls, people. HOWEVER, a trend I find semi-alarming is taking hold around the subdivision: uber-early outdoor holiday illumination. All around the streets and along the greens of the golf course and beside the pocket parks, lights are tracing the roof-lines and bedazzling the shrubbery of our sprawling neighborhood. The moment the jack o’ lanterns and (creepy-but-not-for-the-reason-they-meant) fakey tombstones disappeared, up on the housetop went the (plastic) reindeer paws. Like November 1st. 1. The onslaught of flyers left on doors and sent in the mail advertising earlybird discounts on pro lighting hangers (is that what you call them?) if you have your installation errected -heh heh- prior to Thanksgiving. These people like their lights, they just don’t like to hang them. Or pay full price. 2. The property management company’s decision to start sticking garland and holly-like plastic-y stuff up on every sign and lamp post they can chase down beginning at like 11:59 pm on Oct 31st. I know you manage a lot of territory, but COME ON. It’s a slippery G.D. slope, folks!!! The masses are watching, and falling prematurely in line. I actually kind of get all of that. I would make Clark Griswold look like a savvy veteran if I tried to decorate the outside of The Casa, AND I totally get the whole “when in Rome, decorate when the Romans do” thing, AND I do love a bargin. Just because the lights are up does not mean you have to turn them on. ‘Tis not quite the season to be Fa la la-ing in the festive light of your glowing assortment of inflatables. As Hermie tells Rudolph when hiding from the Bumble – Douse the light!